In the United Kingdom, her majesty the Queen (Elizabeth II), Prime Minister Theresa May, and well known writer Piers Morgan of the Daily Mail, are amongst countless other people whom are not spoken for on mainstream media, who are all for a red carpet state visit from Donald Trump to the U.K., since many people want him to visit and everyone knows how valuable this is for the special relationship between the superpower nations. The U.S.A and the U.K. have been each other’s closest allies in recorded history since the World War II and if Trump comes in attendance, it strengthens future trade, business and understanding on common goals. So, in these changing times for the better, sickening socialists hacks like Sadiq Khan will try to spin his web of “bs” over “Fake News” platforms like CNN. Once again, stating that he doesn’t think that the U.K. should allow a stately visit from Donald Trump to the British Isles. As you can see, there’s some major evil entities residing in the United Kingdom and one of them happens to be, the socialist, jew-hating, terrorist sympathiser, the Mayor of Londonistan, Sadiq Khan. Then you have the socialist fake news networks, such as the BBC (sorry, it’s colluded to the One World Agenda, to no end, nowadays) plus Sky News, and all the other mass media broadcasting stations whom are running their old tricks, which educated and sensible people do not even pay attention to anymore. Their latest lie is that Donald Trump held a secret one hour meeting with Vladimir Putin at the G20 summit, whilst publicly sitting next to him. Hmmm, maybe that’s just “FAKE NEWS!” A secret meeting in public? Piss-off! But yesterday, also you didn’t hear the BBC or Sky News report over the scandalous fact of voter fraud on part of the Labour party in the recent General election’s on June 8th. Amazing, right?! Hmmm (chinner!) Please see our article from yesterday on this topic. So, how’s the majority of United Kingdom’s news coverage and press not been exposed as such a completely biased and socialist brainwash medium by now? Well, because to perpetrate the “One World Agenda” of open borders, when the public clearly demanded Brexit, Satanic forces need to use the media to pollute the minds of the populous, by the repetition of lies, so that Satan can rear his ugly hand into the mainstream news coverage and attempt to further brainwash the public into not having any thoughts of their own. Textbook stuff, if you hadn’t already learned by now. Well, not everyone is a total sheep and is that stupid. You underestimate the British public that are not spoken for. Clearly Sadiq Khan stands up for his own selfish ways and his own socialist agenda, which is seemingly to turn London into a backwards socialist city without eyes for prosperity, but with eyes for tragedy and increased bombings, vehicular terror attacks, more Islamic acid attacks, burning buildings, and his philosophy that “Terrorism” is part and parcel of living in a big city. Wow! This man really is the Mayor of Londonistan and definitely not London. Maybe Sadiq Khan’s feelings have been hurt, because he’s been called out on his shambolic views by Donald Trump over Twitter? A big ouchie for Sadiq, then… Let’s be clear, the Queen of England can’t stand Sadiq Khan, Theresa May probably isn’t a huge fan either, nor is Nigel Farage or any conservatives or sensible mind, and Piers Morgan has even had enough of him. A person that usually has to sit on the fence, has expressed his views on Sadiq Khan already and very publicly. That’s a pretty good and esteemed representation of the British people then, don’t you think? So, with the recent scandal of “Voter Fraud” in the general election in the United Kingdom, with organised University groups voting for Labour twice (cheating), favouring the Marxist lunatic Jeremy Corbyn, it raises the question if there could have been systematic voter fraud in the election of Sadiq Khan in the London Mayoral elections of 2016, as well? Just throwing it out there. Maybe many people were also able to vote twice? Just maybe? Who knows? It seems very likely at this stage. Sadiq Khan is so smug, sheepish, childish, and as Piers Morgan said, an utter “Pipsqueak”. We encourage you to watch this video, where Sadiq Khan initially refused to ban the terrorist group Hezbollah’s and their flags from flying at a pro-Palestine march and he only filed it to be banned two weeks afterwards and seemingly very reluctantly so. Do you see now? 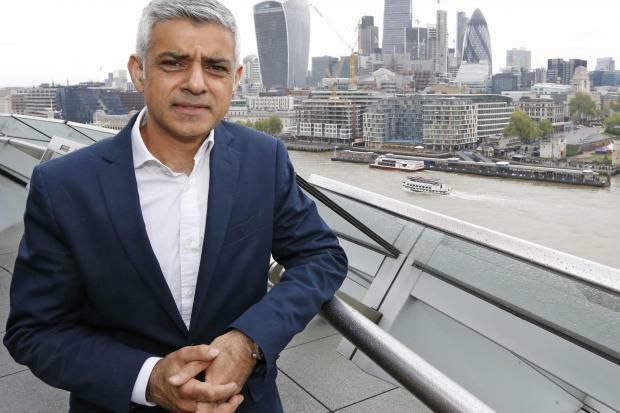 He is the Mayor of Londonistan, plus how of it was even so difficult to even find this video down below, with the audio still audible within it, in these days of colluded times over YouTube, even. Of course Sadiq Khan is opposed to Donald Trump, because Trump is Anti-Terrorism, he’s for protecting borders and where as the Mayor of Londonistan is seemingly pro-Hezbollah, you see? He’s not a representation of London, he has shared a stage with people with direct ties to Hammas, Al-Qaeda, Al Nusra, ISIS, the Muslim Brotherhood, and is a known socialist who is for further immigration, open borders, the E.U, and pro-free socialist handouts of your tax money to unemployables from the Middle Eastern and Muslim regions. He is much like all the other lying socialists who make false promises throughout history, across the world. Who is he to say that Donald Trump shouldn’t be allowed a red carpet state visit to the United Kingdom? Firstly, Sadiq Khan is not a proud westerner, how could he be if he has ties to known Jihadi organisations and people who have direct links to terrorism? Sadiq Khan is an embarrassment and an affront to the sovereign nation of England and Great Britain, who demanded Brexit and it is clear that he’s just another socialist globalist puppet that’s so shadow world government that it smells to high hell. Perhaps, if he could be a little more centrist or neutrally false, people wouldn’t call him out on his ties to people, who sympathise with “Terrorism”, perhaps? So, is he the Mayor of London or Londonistan? He called Moderate Muslims out as “Uncle Tom’s” in an interview in 2009, so should people really be listening to Sadiq Khan’s rhetoric at all? No, we don’t think so either. Calling moderate Muslims “Uncle Tom’s” should set off major alarm bells in the minds of all people that are actual proud westerners. Now we think that people should gather a petition for his resignation and keep on doing so, because his latest call for a declined state visit for Donald Trump to the United Kingdom, is a major conflict of interest for England and Great Britain in these times of socialist collusion. Why don’t you all do some research too, like we have? You’ll dig up all kinds of dirt on just why he’s not a good Mayor of London, and why he basically shouldn’t be the Mayor of London in the first place. After all, he protects the values of domestic terrorism, amongst other horrible things, like being a colluded globalist socialist puppet, that doesn’t have the power to override Theresa May, nor the Queen of England, or the will of the underrepresented public, all of whom are not spoken for on or by biased left-wing news networks like the BBC, Sky News or CNN. Maybe Sadiq, you should take back your recent comments on Donald Trump’s state visit, eh? You’re damaging the alliance! You’re an embarrassment to the city of London and its whole history.